E To clarify the first few generations of Pease's to America beginning with the immigration of the brothers John and Robert Pease in 1634 aboard the ship Francis. To help clarify the English Ancestry of these brothers by an examination of the parish registers of their English parish of St. Mary's in Great Baddow, Essex County. To provide a brief description of the major sources used in these pages and other resources yet to be examined. To provide a "Cousins" page to which descendants can contribute their line and make contact with others. As one can see, the sons and grandsons of Robert and Lydia Pease founded the town of Enfield and have produced the majority of the American descendants of John "The Clothier." 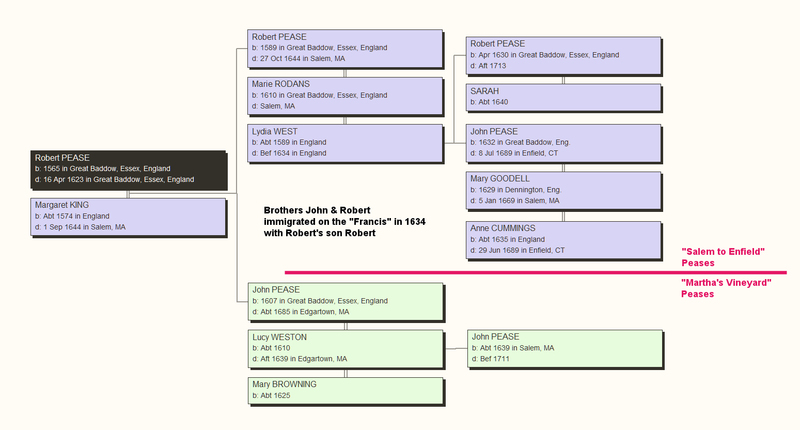 Much more information on both lines is in the Register Report on this website which begins with John's son Robert Pease (1565-1623), the father of John and Robert who immigrated in 1634. A summary of an article on a 'famous' colonial Pease ancestor. 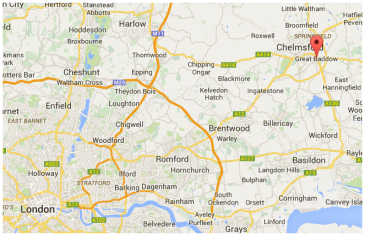 That the American branch of the Pease family originates from Essex, and Great Baddow, is fairly certain. But in reality, firm documentation as to the English Ancestry of the Pease line only goes back several generations into the records, and the American relationship to the English branch may never be known for sure. The English branch has been described by Charles E.G. Pease on his web pages (see the "Cousins page") and it includes some very interesting "fathers" of the English Industrial Revolution. The lineage presented by Philip Rice in his book on the Pease family goes back to Robert Pease "The Smythe" who lived between about 1485 and 1550, but whose existence is only told by an entry in the parish register of the burial of his wife Joan: "Joan Pease, widow late the wife of Robert Pease was buried 25 February 1552". Two earlier burial entries indicate daughters, but it is even presumptions to state that the entry "John Pease Smythe was buried 13th October 1556" is that of his son. The family of John Pease "Smythe" is a bit more certain, and the lineage gets even firmer in the next generation, but the fact remains that no records exist further than 1540. For the serious student of this, I have placed not only Philip Rice's version of the lineage online with annotations and notes, but also the register as he published it. There is more about this subject on those pages, links to which follow. The Essex, England 16th Century Wills containing the Pease Surname. Also included is the will of Richard Hyches - the father-in-law of John "The Clothier".